Eliminate Chemicals Sanitizer's in Pools and Spas. ool or spa? This is it! A cleaner hot tub without the constant chemical maintenance, and the ongoing expenses. Mineral Ionization is the easiest most affordable alternative to chemical sanitization. Ionization is a process that occurs naturally when atoms loose or gain electrons. Natural minerals when electrically charged act as ionizers. Unlike other systems, our Ionization system uses 3 types of metals (silver, copper, zinc) providing the best system on the market. Silver (Ag) ions kill over 650 types of bacteria, viruses, and protozoa such as HIV, Legionella Pneumophila(legionnaire’s disease) streptococcus, E-coli, salmonella, and most viruses. Silver has been successfully used in ailments such as acne, athlete's foot, lesions, poison oak, rashes, septic ulcers, sun spots, skin cancer, warts and yeast infections. Silver is also beneficial in treating minor bites, burns, wounds and scrapes. In the ancient Greek civilization, the royalty used to drink from silver goblets and their water was stored in silver urns in order to purify their drinking water. Today NASA uses Silver to purify water for astronauts. Copper (Cu) ions prevent algae growth. Copper is recognized as one of the best algicide killers known to man. Zinc (Zn) stimulates healing of the skin and prevents stains and rings on the hot tub. Leaves the skin silky soft and helps heal skin irritations. From a health standpoint, water ionization is completely safe as no toxic chemicals are produced or consumed. The system is environmentally friendly. The water is healthy, sanitary and odor-free. Water quality is improved dramatically. The water feels fresh and clean and has no chemical smell. The ion system is ideal for those who allergic or very sensitive to sanitizing chemicals. It is non-corrosive. It is chemically-neutral, so water balance is often easier to maintain. The system is easy to install and maintain. State-of-the-art Microprocessor Controls – The DC current supplied to the electrodes takes into account the salinity, chemistry and conductivity of water. 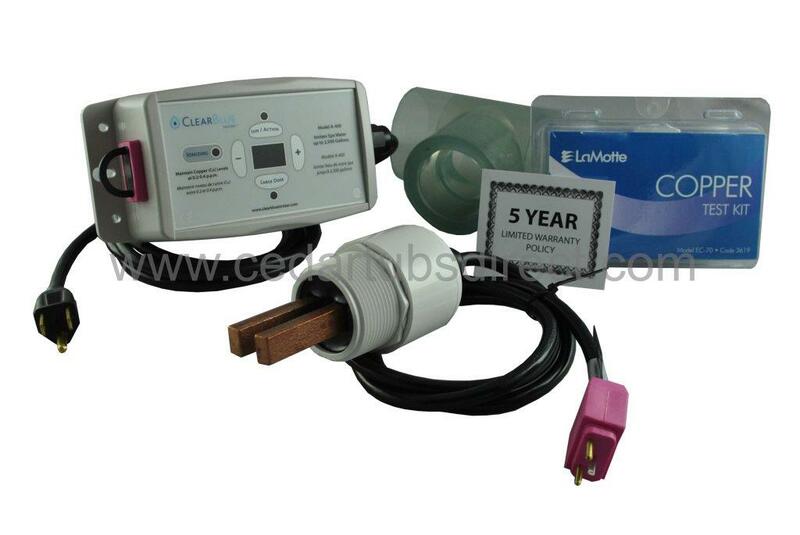 This ensures the electrodes will not corrode faster than necessary for proper pool sanitation and maintenance. Digital Display – Helps with accuracy in maintaining the correct ion level. There are 99 settings (0-99) depending on your water capacity. In very basic terms, the Water Ionizer works as follows. An anode made of silver, copper, and zinc is placed in a "T' chamber. This chamber is mounted in the recirculation system of a pool or spa. 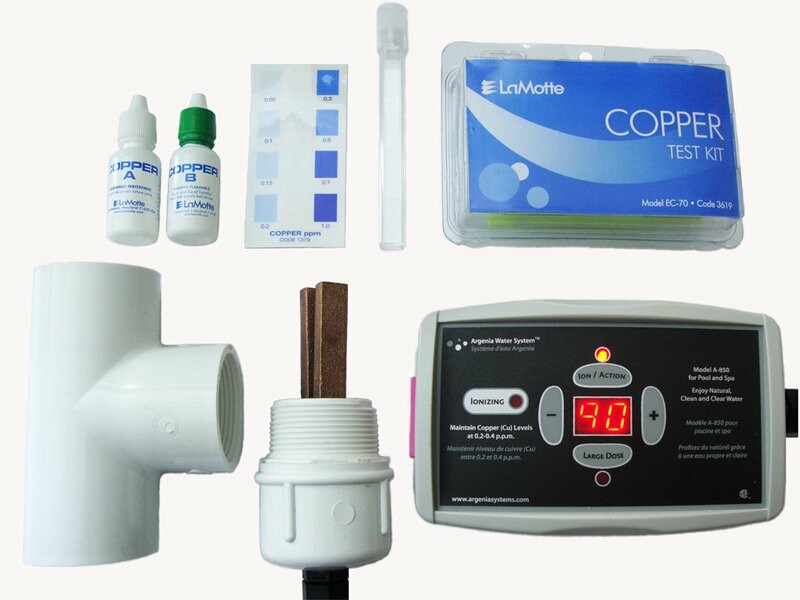 A safe low voltage DC current controller sends signals to the anode causing microscopic particles (ions) of silver, copper and zinc to be dispensed into the water as it passes through the chamber. These ionized particles then do their job safely without any chemical sanitizer. This unit will safely sanitize pools up to 15,000 Gallons.